Reg. Refund to Country - The country of the client's account. Account and Bank details. The bank details of the account can be automatically filled by using the Banks Index button. 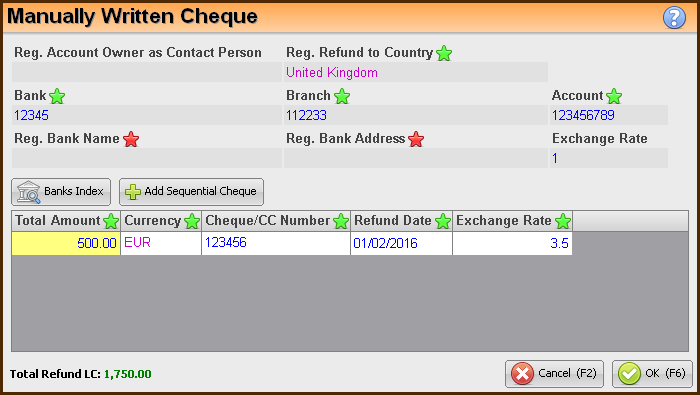 Cheques details - Fill in the Total Amount, Currency, Cheque Number, Refund Date and Exchange Rate. Use the Add Sequential Cheque button to add a row to the table with the details of the following cheque and with a following Payment date. By using this button the Total Amount and the Exchange rate will be the same as in the first cheque, but can be modified by the user. The Total Refund amount will be presented at the bottom of this window.